"There was no quiet on the Western Front!" 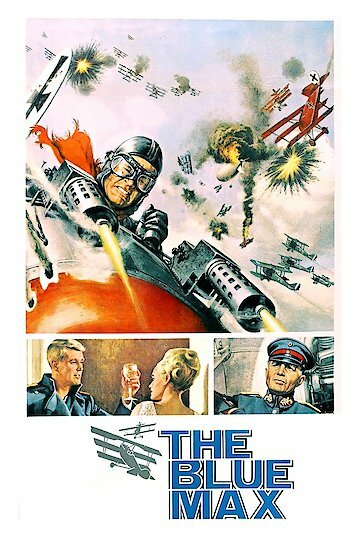 The time is 1918, the start of World War I. Bruno Stachel is a corporate in the German army who stops fighting in the trenches in order to pursue his dream of serving his country as a fighter pilot in the German Air Services division. His mission is to be awarded Germany's highest military honor, an award called the Pour le Merite, known to many as "The Blue Max", given to the pilot capable of shooting down 20 enemy aircraft. Stachel immediately is at odds with his superior officer because he finds no place for chivalry in war. When his first kill is discounted because he cannot produce a witness, he spends hours searching for a piece of wreckage as proof. In future kills, he proves he will stop at nothing, including shooting down an already wounded Allied gunner, in order to add to his list of official kills. He is not above lying and claiming another pilot's kills as his own. Officials award him the coveted Blue Max, despite an ongoing investigation into the veracity of Stachel's total number of kills. But Stachel's pride and ruthlessness finally get the best of him when he tests out a new monoplane. The Blue Max is currently available to watch and stream, buy on demand at Amazon, Vudu, FandangoNow, iTunes, YouTube VOD online.